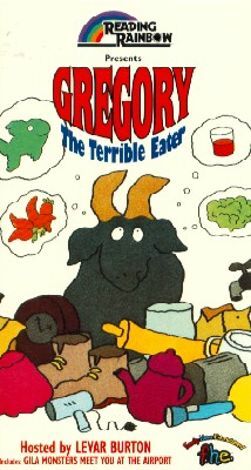 Young viewers get a lesson in what comprises a balanced diet in Reading Rainbow: Gregory the Terrible Eater. The featured story concerns a goat who prefers a strange selection of foods that include fruit, juices, vegetables, and eggs. After parental intervention, he begins to like a more goat-oriented menu. At the San Diego Zoo, LeVar Burton checks out what the animals are fed, and winds up with a group of kids who are getting cooking lessons from a chef. Other food-related books reviewed are Mrs. Pig's Bulk Buy by Mary Rayner and the Better Homes and Gardens New Junior Cookbook, edited by Gerald Knox.